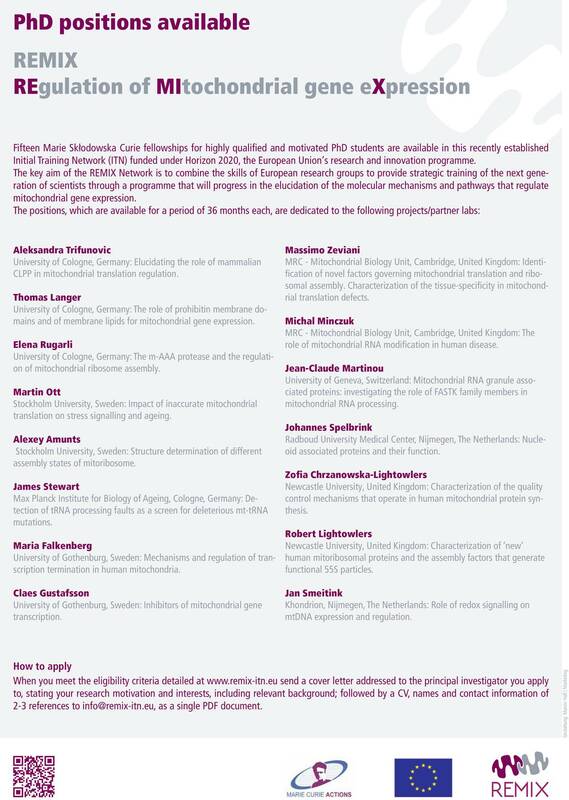 Fifteen Marie Skłodowska Curie fellowships for highly qualified and motivated PhD students are filled in this recently established Initial Training Network (ITN) funded under Horizon 2020, the European Union's research and innovation programme. The key aim of the REMIX Network is to combine the skills of European research groups to provide strategic training of the next generation of scientists through a programme that will progress in the elucidation of the molecular mechanisms and pathways that regulate mitochondrial gene expression. 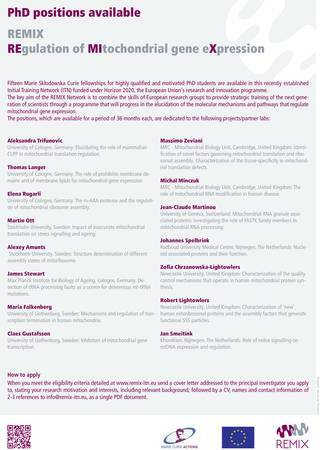 Early Stage Researchers (ESR) - PhD students: means researchers who -at the time of recruitment by the host organisation- are in the first four years* (full-time equivalent research experience) of their research careers and have not been awarded a doctoral degree. Mobility - The researcher must not have resided or carried out his/her main activity (work, studies, etc) in the country of his/her host organisation for more than 12 months in the 3 years immediately prior to his/her recruitment. Short stays, such as holidays, are not taken into account.